Looking for free printable sudoku puzzles? Welcome! You've come to the right place. 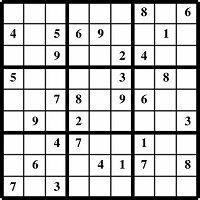 On this page are 100 free sudoku puzzles I made that you can print out right now. There are 4 sudoku puzzles per page. 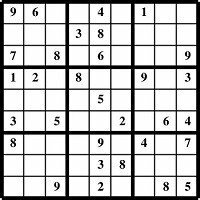 The printable sudoku puzzles pages below are listed in order of difficulty. 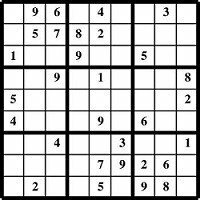 If you are new to sudoku, start with an easy puzzle. Or if you're a sudoku whiz, go for the harder ones. See below for a summary of the rules of sudoku. Want to play sudoku online in your browser? Visit my Free Sudoku Games page. To print a puzzle page, click the "Print This Page" button at the top of the page. The solutions pages are provided as well. Here's a summary of the rules of sudoku, in case you've never played before or need a refresher. The rules are quite simple, actually. The hard part lies in solving the puzzle! 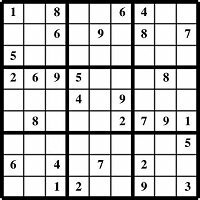 A sudoku puzzle consists of a 9 by 9 grid. This grid is subdivided into nine 3 x 3 boxes. Some of the cells in the grid are prefilled with a number between 1 and 9, while many other cells are blank. Your job is to determine the correct number to be entered in each of the empty cells. The numbers 1 through 9 must appear exactly once in each row. The numbers 1 through 9 must appear exactly once in each column. The numbers 1 through 9 must appear exactly once in each 3x3 box. The challenge of sudoku is using the process of elimination and other strategies to identify the unique solution for the sudoku puzzle. Sudoku really is an excellent brain game, as it trains logical reasoning and visual perception, among other brain skills. Sudoku is my favorite logic puzzle. I have a hand-held Sudoku game (with stylus) that I play all the time. Even though I practice, I'm not very good. But it's a great brain workout anyway. Anything that stretches your mind will help keep your brain sharp.